Ostrich Twister Dental Chews are highly palatable, 100% natural treats to give your dog. Made from the tendons of South African Ostriches, the treats create a natural flossing effect as the fibres from the tendon move around the teeth making them the ideal dental chew. Ostrich Twisters helps to reduce tartar to give your dog healthy teeth and gums, and also helps keep their breath fresh . These are perfect for my dog, she's had them since she was a puppy! She isn't very well, alot of tummy issues, but these are very good for her. Never cause any tummy upset, and she loves them! 4 A very good product which my dogs love. A bit expensive as it lasted my Dobermann all of two minutes. 4 ( would have been five if it had lasted longer). 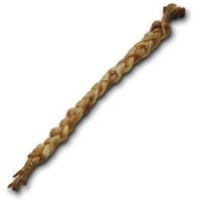 I keep ordering this product time and time again as my dog absolutely loves them and she is a right fuss pot! Recommend them to any dog owner who has a fussy dog, but wants to keep their teeth nice and clean. 5 out of 5. These keep both my dogs amused for ages. Possibly the only thing you cannot talk from either of them. They run and hide taking the chew with them. Have ordered in batches of ten each time, as saves a little money. And it will definitely be a repurchase for them as and when required. Only give them one each at a weekend as a treat.